Here in Johannesburg, on a stunning summer day, Chinese president Xi Jinping must be enjoying waves of warm feelings (and the relatively clean African air) following his "pledges" speech this morning. 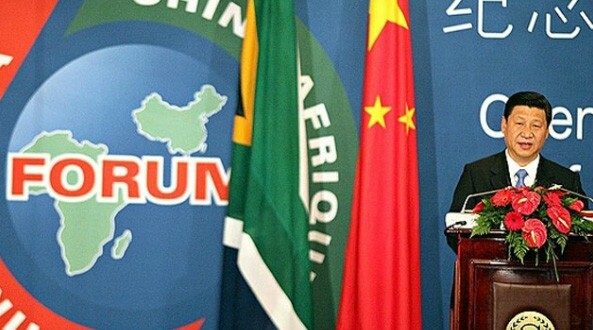 China will continue to support capacity building in Africa. This includes construction of an unspecified number of regional vocational training centers and "capacity-building colleges" that will offer vocational training and education to 200,000 Africans. The time frame for this was not stated but we can expect that this will be rolled out over the next six years: three years to get the construction started, and at least another three years to make them operational and establish programs. Shipping Chinese trainers to Africa has not gone over all that well in the past. Ethiopia had to bring in Germans to replace the Chinese instructors at its Chinese-built vo-tech college. Let's hope that someone in Beijing is thinking strategically about how to build up the African expertise for teaching all these students "how to fish." China will support the construction of five "Jiao Tong" ("Jiao Tong" means "Communications") universities in Africa. Hmmmm. Will these be like the prestigious Shanghai Jiao Tong University, known for its quality research across a number of disciplines? At first I thought these might be efforts to steer the training of journalists in more China-friendly directions, but it seems that Jiao Tong is better translated as "transportation" -- as a reader pointed out below, in China Jiao Tong universities "are elite schools in training technicians, engineers, and scientists" ... not journalists. This will fit nicely with bringing the "One Belt, One Road" Initiative to Africa, training Africans in the higher technical skills (see my Foreign Policy piece for more on this). To fund these and other programs, China will provide $5 billion in grants and zero-interest loans, and $35 billion in a combination of preferential loans and [non-preferential] export credits and concessional foreign aid loans. He also pledged to add another $5 billion to the China-Africa Development Fund (so it will now be expected to eventually reach $10 billion) and increase the China Development Bank-funded African Development Special SME (small and medium enterprise) Loans by another $5 billion (this was originally set up at $1 billion). Finally, he seemed to pledge to set up a new China-Africa Industrial Cooperation Fund with $10 billion. This emphasis on manufacturing is very welcome and something I expected, given all the discussion about Chinese offshoring lower cost manufacturing to Africa over the past several years.